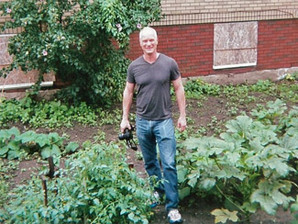 John Taylor, standing in a vegetable garden he found blooming in a vacant lot. Photo courtesy of John Taylor. 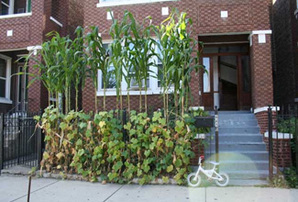 A garden of tropical corn, cucumbers and hot peppers has taken over the front yard of an apartment building in a Latino neighborhood in Chicago. Photo courtesy of John Taylor.